Griot's Garage Rinseless Wash & Wax 128 oz. Home > Shop By Brand > Griot's Garage Car Care for the Perfectionist > Griot's Garage Rinseless Wash & Wax 128 oz. No hose, no rinsing, no hassle! Griot's Garage Rinseless Wash & Wax is a highly concentrated rinseless washing formula that will remove dirt, dust, debris, fingerprints, and more from your paint without the need for scrubbing and rinsing. Using advanced hydrophobic polymers and carnauba wax to lubricate the surface during use, Griot's Garage Rinseless Wash & Wax not only safely cleans the surface, but it also leaves behind a layer of protection! Whether you're in an area with water restrictions, stuck in your apartment's parking garage, or just always on the go, Griot's Garage Rinseless Wash & Wax will keep your car clean without the hassle! Griot's Garage Rinsless Wash & Wax can be used in conjunction with the Griot's Garage Rinseless Wash 15:1 Dilution Bottle as a waterless wash, clay lubricant, or drying aid! Rinseless washes have quickly become the easiest way to wash your car if you don't have time for the whole shebang – buckets, water, sponges, hose, etc. etc. 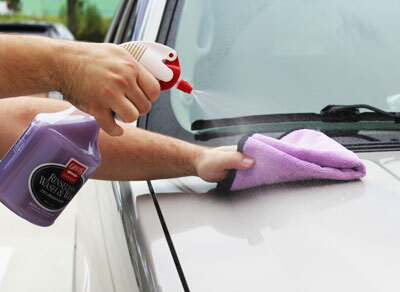 But, if you use a sub-par rinseless washing formula, you run the risk of instilling scratches in the paint. What you want is a high lubricity formula that fully encapsulates the dirt and dust to allow for safe removal – what you want is Griot's Garage Rinseless Wash & Wax. Griots Garage Rinseless Wash & Wax has taken the rinseless wash phenomenon one step further by offering a formula that not only cleans the surface, but also protects it! It's two steps in one! Griot's Garage Rinseless Wash & Wax is ideal for mobile detailers, customers living in an area with water restrictions, and people that have limited access to a washing area. Use Griot's Garage Rinseless Wash & Wax to safely clean all exterior surfaces including paint, glass, wheels, door jambs, clear plastic, chrome, trim, rubber, and more! 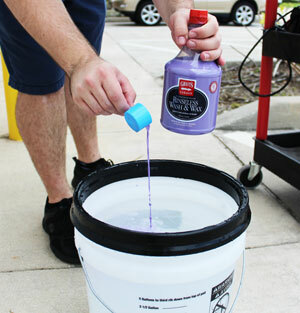 Griot's Garage Rinseless Wash & Wax is super-concentrated and 2 oz. of product is more than enough to do a whole rinseless wash! Before use, be sure to shake product well and work on a cool surface out of direct sunlight. 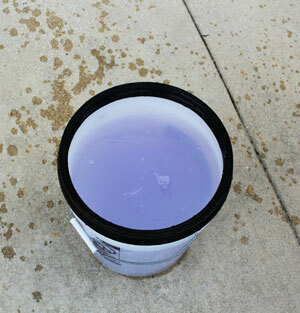 If using a traditional wash bucket, add 2 oz. of Griot's Garage Rinseless Wash & Wax to 5 gallons of water. Allow your washing medium (microfiber towel, mitt, or wash pad) to soak in the solution. Working from the tops down, gently glide the mitt or pad over the surface, rotating often to a clean area. Frequently rinse your mitt/pad and agitate on a Grit Guard in the bucket to release contaminants. If you are using Griot's Garage Rinseless Wash & Wax as a quick wash or to enhance gloss and protection during drying dilute 15:1 in the Griot’s Garage Rinseless Wash & Wax 15:10 Dilution Bottle before use. I have used this on a few details and really like it. The Gloss is noticeable and has a silk like feel, ( after claying with 1 oz to gallon water as a clay lube). Nice grape like smell. Will be using this over the winter as my rinseless wash. Griot's Garage makes awesome products. Nice friendly service and helpful if any questions. ProsWorks as described, noticeable Gloss, silk like feel after drying, seems to let the water bead up. Great as a clay lube and even as a detail spray. Not sure if designed as a detail spray. Very happy so far. ConsWish they had a list of delusion ratios for other uses.